Peter Stone is co-organising the Call for Papers for Culture Under Threat, a joint conference organised by the American University of Rome, Blue Shield, World Archaeological Congress, and Newcastle University. 2014 marks the 60th anniversary of the 1954 Hague Convention on the Protection of Cultural Property in the Event of Armed Conflict and its 1st Protocol and also the 15th anniversary of its 2nd Protocol. Sadly, almost every part of the world has seen armed conflict since 1954 and cultural property has been damaged in all of these conflicts through collateral destruction, military insensitivities, and extensive looting. The conference will be held May 15-21, 2014, at the American University of Rome. It will review what actions are currently taken to mitigate the destruction of cultural property during conflict and address what might be done in the future to enhance its protection and to restrict and counter the trade in illicit antiquities that feeds off conflict. The conference will conclude with a discussion of a draft of the World Archaeological Congress’ Accord on the Protection of Cultural Property in the Event of Armed Conflict. Call for Papers: Abstracts of no more than 200 words for papers should be sent to peter.stone@newcastle.ac.uk or friedrich.schipper@univie.ac.at by Monday 14 April 2014. Authors of accepted papers will be notified by Monday 21 April. Last month Myra Giesen delivered a presentation on the ethical and legislative framework surrounding the curation of human remains. The event, held appropriately at the Royal College of Surgeons, London, was organized jointly by the Human Remains Subject Specialist Network and the Museum Ethnographers Group. Contributors included leading practitioners in the field, including specialists from the Natural History Museum and the Museum of London. 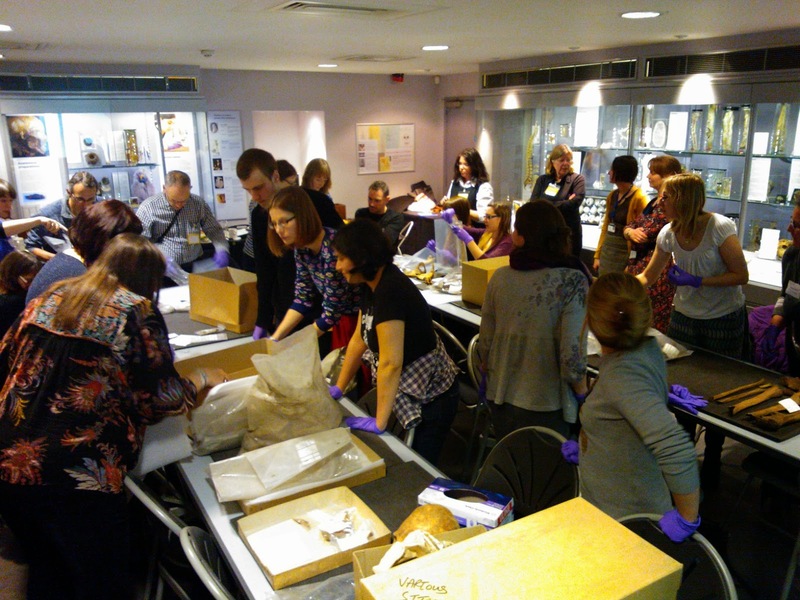 More than thirty curators, conservators and archaeologists attended the London event and future workshops on the topic and a possible online version are planned. For further details of the February workshop and for news on new event dates visit the Museum Ethnographers’ Group Blog. Visiting speaker: Sheila Watson, School of Museum Studies, University of Leicester. Sheila Watson’s presentation will suggest that museum studies has lagged behind social sciences in the growth of interest in affect and emotions, to the detriment of our understanding of the ways in which visitors engage with objects, narratives and displays. Drawing on case studies Sheila will consider how emotions are culturally regulated and how research can help us develop a more subtle concept of what sorts of emotionally driven learning takes place in museum sites, and how exhibition design facilitates certain types of emotional responses from visitors. This talk will focus specifically on history museums. Dr Sheila Watson is a Senior Lecturer in the School of Museum Studies at the University of Leicester. She is a historian with particular interests in narrative and affect in museums, particularly in institutions which deal with archaeology and history. Sheila’s recent research has explored how the museum deals with military history and concepts of myth and popular memory, and how this contributes to contested national histories. Sheila was co-investigator on the recent EuNaMus European National Museums and the European Citizen project, a three year investigation into the ways in which histories are made and consumed in European national museums. Watson, S. ( 2013) ‘Emotions in the history museum ‘in A. Witcomb K. Message (eds) Museum Theory: an expanded field,Oxford, Blackwell. Knell, S.J. , 2012., Axelsson, B Eilertsen, L. Myrivili, E. Porciani, I. Sawyer, A. and Watson, S. Crossing Borders: Connecting European Identities in Museums and Online, Linkoping University Press, Linkoping. Watson, S. (2012) ‘Museums and the origins of nations in Poulot, D and Bodenstein, F (eds) Grand Narratives of the Past: Traditions and Revisions in National Museums: 545-565 University of Linköping.